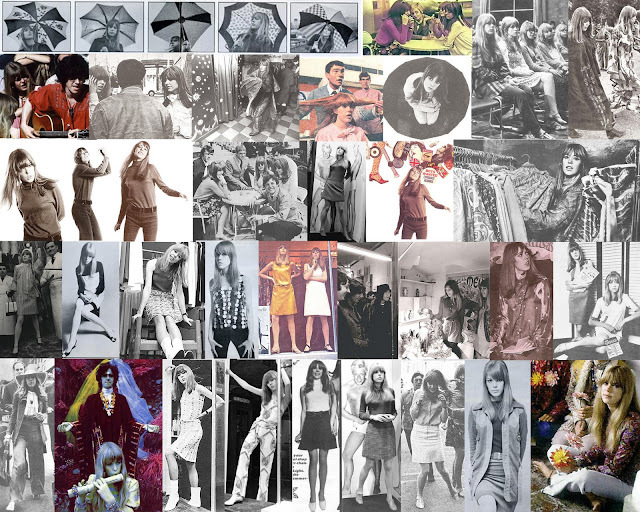 Jenny Boyd, the younger sister of Pattie, was born in November 1947 as Helen Mary Boyd. Pattie chose instead to call her Jenny after one of her favorite dolls. Jenny spent the first six years of her life living with her family in Kenya, until moving back to London in the mid-50s. While still in school, she followed in her older sister’s footsteps and Jenny became a model in London. In 1967 Jenny relocated from London to the Haight-Ashbury district in San Francisco, where Pattie and George famously visited her. The following year, she moved back to England. In 1968 she went with Pattie and the Beatles to India to study with the Maharishi Mahesh Yogi to study transcendental meditation. While in India, Donovan arrived reportedly in pursuit of Jenny. Donovan met her in late 1967 and fell in love with her, writing the number 5 hit song “Jennifer Juniper” about her. Donovan recalled in his autobiography that “Jenny was a fair-haired English rose. So young-looking was she that I felt like I was about to rob the cradle. I was also attracted to Patti, but she was with George. Jenny had her sister’s manner – a middle-class maid with long, silky hair and bright, curious eyes – and she was obviously attracted to me. We would sit and look at the spiritual books that George and I were studying that year.” They had a brief relationship, but apparently his gesture didn’t take, as Jenny told him that she wasn’t interested in having a serious boyfriend at that point. Jenny later would share an apartment with Magic Alex, who worked in the Apple Electronics division of Apple Corps, and she ran the boutique Juniper and the Apple Boutique in London. Once again living in London, Jenny began a relationship again with Mick Fleetwood. Dating for two years, they were married on June 12, 1970. Seven months later, they welcomed a daughter Amy Rose in January 1971. Two years later, the couple had another daughter Lucy. Jenny’s relationship with Mick allowed her to witness firsthand the many changes in Fleetwood Mac. She saw the declines of both Peter Green and Danny Kirwan from the band from drug abuse, and saw the additions of Christine McVie, Stevie Nicks, and Lindsey Buckingham. In 1974, before Buckingham and Nicks joined Fleetwood Mac, Mick and Jenny relocated in Los Angeles. Feeling out of place in L.A., where Fleetwood Mac was quickly rising in popularity, Jenny tried to find solace in religion and her children, but eventually fell toward cocaine and alcohol – two things readily available in her husband’s music scene. As Mick was on tour with the band the majority of the time, the marriage crumbled, leading Jenny to return to England to live with Pattie (who was by then living with Eric Clapton) for a few months. Jenny later returned to L.A. and moved back in with Mick, remarrying him in 1976. Despite their renewed relationship, the troubles between Mick and Jenny didn’t go away. With the release of the album Rumours, which made Mick an international star, Jenny once again turned to drugs and alcohol to cope with the friction and distance in her marriage. She broke her addictions in early 1977, but this wasn’t enough to help the marriage. Jenny filed for divorce six months later.